Finding happiness is not as easy as shopping for a new shirt, but with a few key points, one can create a path toward happiness that, in the end, will make you look better than that shirt ever did. 1. Find your fuel. Identify an activity that does nothing for you but make you smile or fill you with peacefulness. This may likely be a hobby -- hiking, running, painting, singing, traveling, knitting -- but it is important to make sure it is an activity that you can practice alone. Not that you cannot engage in the activity with someone else, but that you can if you wish. Discovering your fuel will be of great benefit when the inevitable bumps in the highway of life occur (and they will). 2. Learn to enjoy your own company. Humans are social creatures, but we as evolved creatures in the 21st century should know how to entertain ourselves autonomously. This is not to advocate detaching yourself from society, quite the opposite, but the key to finding true happiness is not depending on someone else to bring it to you. Let's face it: people come and go in your life for many reasons, and if the basis for your happiness in life is placed in another person, then your happiness is at the their control. 3. Be creative. Social scientist Dr. Brene Brown says, "Unused creativity is not benign." She continues by explaining that humans are creative beings, and when creativity is stunted, it manifests itself in rage, grief, sorrow, and judgment. Unlocking your creativity, even if the result is only for yourself (in fact, especially if the result is only for yourself) is important to tapping into your core happiness. 4. Be a friend to yourself. All of us have those little gremlins in our heads that tell us how we could have done or said something better, and those little creatures need to be given their walking papers. They take up space and offer no resolution, except to be that one catty friend in the group that we wish would just shut up already (and we all secretly dislike that catty friend). Send that gremlin packing; no longer rent space to that negative voice that spends way too much time commenting on your thighs. One moment at time, learn to speak to yourself like a friend, like you would speak to someone you love. 5. Stop pleasing society. This is going to get some backlash, but give me a few moments. Only you can decide what is right for you, what is best for your heart and mind to live contently during your time here on Earth. This may mean bucking the system or going against the wishes of family. For example, if you do not feel a passion to have children, then you should not let your partner or family push (or shame) you into having children. The same can apply to marriage and career choices. When a big part of your life is not in harmony with what fuels your heart, then you have an conflicted situation. Unhappiness breeds in these areas, spreading like mold in a damp basement. Sooner or later, you will burst from this place of conflict, and it won't be pretty. 6. Give up control. We have all seen them. We call them 'control-freaks,' and we all know them, even when we seem them in the bathroom mirror. People who feel they have lost control in one or more areas of their life will overcompensate in other areas by trying to control every piece of it. The underlying issue is unhappiness. How many control-freaks have you known who have had their lives fall apart anyway, despite their efforts to control every outcome? Come on, let me see those hands. Yep, that's what I thought. Even when a person tries to control everything, $hit will still fall apart. Divorces will happen; cancer will still grow; jobs will be lost; friends will die. Stop trying to control others. Focus on only controlling how you walk through this life, because you are the only one you can control. And let's face it, those controllers are really annoying the hell out of the rest of us. 7. Find your tribe. You may think this is contradictory to #2, but these are two separate and necessary parts which are actually in harmony. Finding your tribe simply means seeking out people who are in balance with your beliefs. These people could be friends you already have or family that you have known since birth. Sometimes, they are respected teachers or new friends discovered in unlikely places. They do not have to do everything together or even live in the same town. These are people with whom you share a mutual respect and support for each other's manner of living, and, through that respect, create mutual inspiration. My tribe is spread across the world and includes people all walks of life. We talk as friends, we support each other's pursuits, and gain inspiration from each other. We are not in competition; we are each other's cheerleaders. 8. Understand your many facets. For American teenagers, much emphasis is placed on choosing a career path that makes one happy. While finding a job that is both emotionally fulfilling and financial sustaining is wonderful when it happens, know that the two points may not always come together, and that is okay. The focus of your happiness should not lie solely on your job. Your employment may be a place that you like and work that you do well, while putting food on the table and a roof over your head. But your fuel (see #1) may be what you do outside of work, and that is okay. Contrary to all the many self-help books out there, sometimes your bliss is not found in your day-job. Sometimes, finding a job that is financially sustaining to your life and 'pleasant-enough' to do each day is all you can expect, while your fuel (again, see #1) can be found outside of your employment. That is okay, and frankly, more common than you think. My own father is a great example, having a day-job in drafting -- at which he was very good -- but his fuel came from his time after work, creating things in his woodworking shop in our garage. By understanding that humans are many faceted creatures, we can understand that happiness may be drawn from the collection of our many areas of interests. Happiness may not come from one interest; it may come from the collection of many interests. 9. Cull the excess. True happiness is not derived from things. It is not dependent on how many shoes you own or how many trips you take a year. It is not determined by your list of friends or the kind of car you drive. It does not have a price tag, and yet it is the most valuable thing in your life. (So, you can stop hanging out with the pompous jerk just because his name on your guest list will somehow impress others.) Learn to live with less because, frankly, stuff happens (see #6) and you really don't want to be the one devastated over the loss of your 50 pair of designer heels. It's just shoes; you'll live. 10. Wipe that goofy smile off your face. Truly happy people don't go around all day grinning like a Cheshire cat or telling people how happy they are. True happiness does not require laughing all day long or skipping to the mailbox. Laughter, smiling, and skipping (if you so choose) are indeed manifestations of happy behavior but should not be forced or expected. You are not advertising for some happiness cult. Truly happy people are content. They do not feel the need to talk about their happiness all the time, but are generally willing to discuss it if someone asks their secret. In my experience, if you have to tell people you are happy, you aren't. 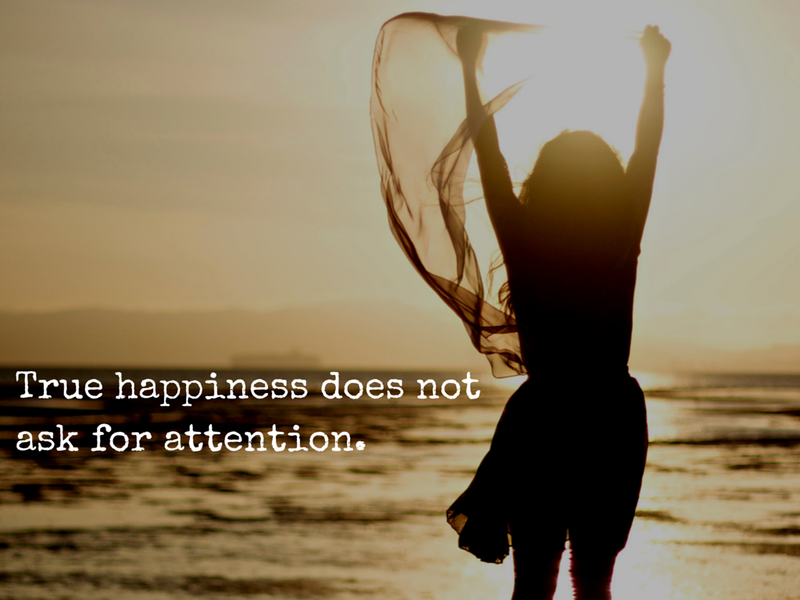 True happiness does not need attention. 11. Self-care, self-care, self-care. The airline industry accurately describes what is needed before people can be of service to others. Every pre-flight instruction includes the phrase about oxygen masks, "Secure the mask over your mouth first before helping those traveling with you." This is not heartless to attend to yourself first, in fact, this instruction shows that you can be of no service to others if you are not sufficiently attended. Self-care can manifest itself in many ways, whether that is setting aside time to walk every day or getting a massage every month. It could mean declining that invitation to chair a committee when your schedule is already full. Perhaps it means a long bath or sleeping in on Saturday. Be sure your body and mind have sufficient care so you can then be fully present and fully attentive to those who need you. Core happiness leans more toward finding the quiet contentment with one's place in the world rather than donning a comedic face and laughing in the face of tragedy. Giddiness is momentary, but true happiness is enduring. Most importantly, remember this is a journey. It is not a race, and it is not a competition. Being mindful of these points during your days will lead you toward being your most contented self, which is right where the happiness lies. My goodness woman!!! You are good! So very darn good! Those eleven points ARE IT. They are the key. YES, we are! Tribe sisters, absolutely :-) We must have been writing under the same moon and caught the same ray of thought. #11 was added at the last minute when I realized I had not practiced it in a bit (and could not understand why I felt so stressed and short-fused). Adjust that, and WOW, things righted themselves quickly.